Here’s our movie of Rincon Parkway, a great place to go camping in an RV! Rincon Parkway is run by the County of Ventura. Approaching it from the north, it starts just south of Hobson Beach County Park and runs for 127 RV camping spaces south a few miles to Faria Beach County Park. RVers can park overnight for $25 (payable by cash or check), but reservations are not accepted so be sure to either come early or have a Plan B in case it’s full. Your RV will need to be totally self-contained, as there’s no hookups and just a few port-a-potties along the entire stretch. But for your efforts you get prime real estate right on the beach! A short walk or drive north or south will also bring to you breaks between the beach houses, for access to great swimming, surfing and body boarding beaches. That's one of those breaks here in the photo to the left. Three Public Beach Areas Named "Rincon"
Rincon RV Parkway sometimes gets confused with two day-use beaches a few miles north, straddling the Ventura County line at the Bates Road offramp: Carpinteria State Beach Rincon Point to the south and Rincon Beach County Park to the north, run by Santa Barbara County. In between them is a gated community. In fact, this area of the coast gives the Rincon it’s name. Rincon is Spanish for "corner," and Rincon Point does indeed create a sharp corner, makig it one of the hottest surfing spots in Southern California. 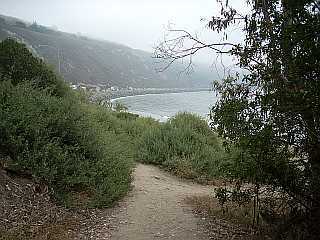 Rincon Beach County Park is a long expanse of beach below the cliffs just south of Carpinteria, with day-use picnic areas, bathrooms, a lawn and barbecues at the top of the cliff by the parking lot. Plenty of free parking. 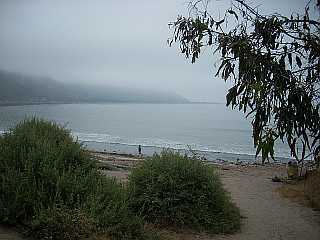 Rincon Point (that's the entrance path in the photo to the left) is a surfer's beach. It has a much more primitive, smaller bathroom facility, smaller parking lot and the beach hugs the rip rap along the highway. In fact there's no beach at all at high tides. But plenty of visitors park along the highway and just climb down to the beach. To get to the Rincon RV Parkway: From Santa Barbara take the 101 south and get off at the Faria Beach/Pacific Coast Highway exit. From Ventura take the 101 north and get off at the Seacliff exit and follow the frontage road north of Emma Wood State Beach. 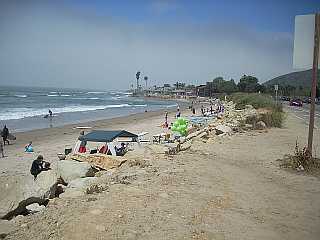 There's no sign from the south, but when you see the RVs along the beach you've reached Rincon Parkway. To get to Rincon Point and Rincon Beach County Park: From either direction on the 101, take the Bates Road offramp and turn toward the beach. Looking to go camping in your RV in California with a group of fellow RVers? Check out the Camarillo Camp Rats! They're based in Camarillo, California, just down Highway 101 from Rincon Parkway, and they post their camping schedule on their Web site! Come back soon! We'll be adding more photos of the Rincon! Return from Rincon Parkway page to the Home Page.